The 2in1 cordless cleaner has been interpreted in many different ways, but Beko reflect a more traditional upright design with their £220 'Cordless Handheld & Upright Vacuum Cleaner Deluxe VRT6221P'; and then throw in a few clever quirks, such as incorporating two dust bins, two filter units, and a multitude of included accessories. Emptying the well-packed box takes time. Just when you think you’ve got everything out you find another accessory nestling in a piece of cardboard packaging. Assembling the Beko Stick Vacuum and charging dock is a simple process of following the instruction manual, which fortunately has good illustrations to help. The hand-held cleaner holds the battery and motor, of course, and when this is removed from the upright unit there is a remarkable choice of eight cleaner tools to use with it. Included tools are: a two-in1 brush, a long flattened crevice tool, a soft hair brush, a bed brush, a turbo brush, a ceiling brush and a sofa cleaner with attachable hair brush. There are also two exceptionally useful inclusions of an elbow joint and a flexible hose. The Beko looks sleek in two-tone grey with purple-pink dust cups and handles. 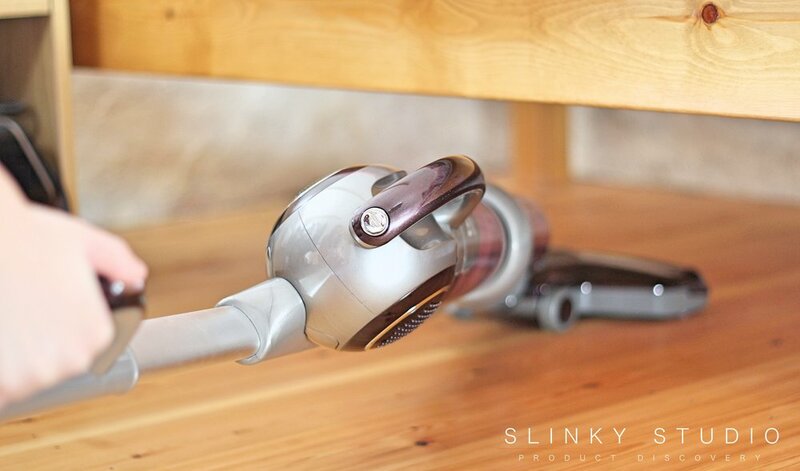 It’s undeniably following the Dyson styling with the accessories and shaping - but it works. As a cordless upright cleaner, the Beko, at 4.8 kg, is a few hundred grams lighter than the Vax Air Cordless Lift, the Hotpoint Ultimate Collection PowerMove and the very similar in hybrid design terms, Bissell MultiReach ION+ 2in1. Also its motor runs fairly quietly at 80 decibels (we judge it by the cat, who didn’t wake up when it was switched on); albeit the brush-bar, whilst not necessarily noisy, is unusually harsh in tone. Because it’s a light machine we feared it might be fragile, but soon discovered that all the switches, clip-on devices/connections are pretty durable and don’t feel as though they are going to give up any time soon. Big tick for Beko on that one! We’ve been swapping devices, clicking and pushing, and all the joints and connections remain positive. The charging dock has places to store some of the many clip-on tools, but sadly not all; a common problem with modern cleaners. Fairly simple affair. One button for engaging power to the upright cleaner and another, on the removable handheld portion, to switch between the two power modes. Floor Cleaning + Self-Drive… it’s true! In upright mode the Beko runs off on its own with a SelfDrive feature. It’s an interesting experience as you really only need to walk behind and guide it, especially on hard floors. It's a gentle pull and genuinely helpful - you don't feel it will run away with itself. 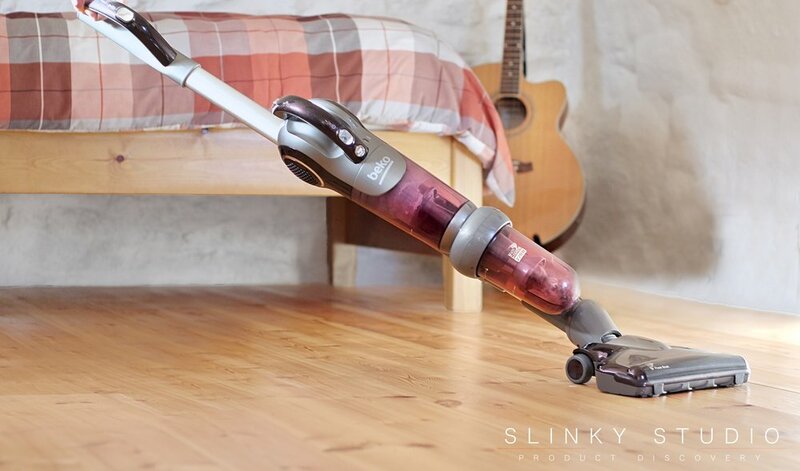 The main floor head is compact and with the SelfDrive it is amazingly agile around table legs and corners, and its slim body will squeeze under furniture as low as the bed frame seen in our photos. The brush-bar design is a simple nylon affair, yet has proven effective at whisking pet hair and static dust off our floors. Our carpet flour test revealed that in two passes the Beko removed all the flour, putting it on an even keel with the Vax Air Cordless Lift which is around £100 more expensive and not to mention a lot more bulky. One of the team who tested the Beko lives next to dusty potato fields and has a solid fuel fire, loads of book-cases filled with books and papers, and a cat, so they need a vacuum cleaner that can readily reach awkward places whilst also having enough suction to remove dust and hairs wherever they appear. Sucking the dust from the top of books and cleaning cat hairs was not a problem for this machine. With one click of a button you remove the handheld portion away from the stick. The Beko is powered by a 220W light-weight digital brushless motor. It has three-stage cyclone dust and air separation technology (20% better than two stage it claims). When you look into the dust cup and see all the static dust it can pull up from your sofa or mattress, you’ll breathe better, literally. During our testing we found that although there are two speed settings, the low level is totally suitable for day to day routine cleaning, especially when using the ‘soft hair brush’ on delicate things like paper lampshades, hanging pictures and curtains. Nevertheless, where we needed more suction to whisk up ash fallen from the fire and those embedded cat hairs on furniture the higher setting was selected. A standout accessory is the elbow joint. If you fix the 2in1 hair brush, the long flattened crevice brush or the soft hair brush to this it makes the tops of books, tops of picture frames, upper sides of shelves, and the tops of curtains super simple to attain. You don’t get aching arms from having to hold the handheld cleaner horizontal. Another big tick for Beko here. The other useful accessory is the section of flexible hose, which is often not any longer available with hybrid cleaner designs like this. It comes into its own inside cars, together with the long flattened cleaner tool and the turbo brush. Having two separate dust cups does, of course, mean double the emptying. They are quite easily dismantled but are fiddly compared with the single push-down lever on Dyson and Vax cleaners. There is a small wire brush included that usefully helps in cleaning the metal filter. The wire brush is also supposed to have a screwdriver head at one end which can be used to unlock the roller on the main floor brush and turbo brush, but actually a coin is far better. One of our main issues with this Beko is the 25 minute operating time. With its multifarious accessory heads it can be used in so many ways that 25 minutes is simply not long enough. This problem is compounded by a 5-hour charging time for the battery, which appears to be a trickle charge to preserve it for years of cleaning use. A solution for this would be to take the Vax approach and offer two batteries. This would be a huge benefit, avoiding it being confined for use only in smaller homes and apartments. On the plus side it’s easy to slip the Beko onto its power connection dock and it doesn’t take up too much room either. The Beko Stick Cleaner is a stylish and well-made run-around with considerable power for its class. 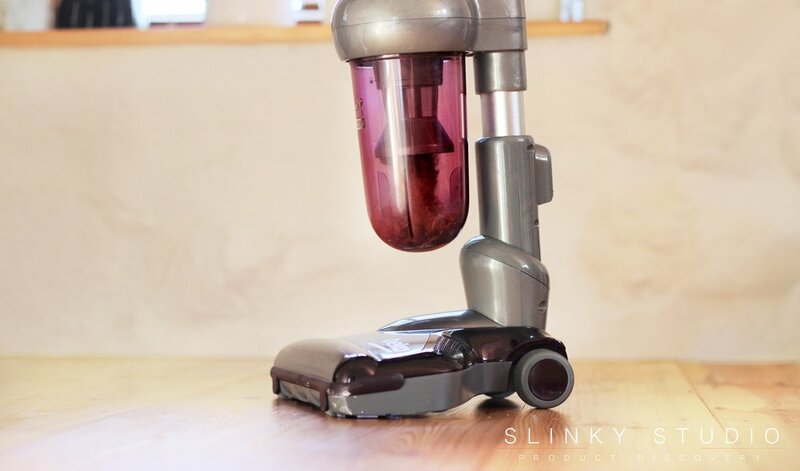 It is ideal for a quick pick up and clean as soon as the crumbs are made, or while the dog nips out for a walk and you do a quick anti-fur on the comfy chair. With its truly comprehensive bundle of tools, not to forget its self-drive manoeuvrability, cleaning is a relative breeze. However, the restrictive 25 minute battery makes it best suited for smaller houses or for an apartment setting, as the 5hr wait to charge is too long with no second battery option.